Inquiring about whey protein side effects or the side effects of any supplement is a very positive sign. It shows that you care about your health and that you are cautious about what you put into your body. I feel it’s important to always do research before buying new supplements. It may make me a bad person, but I just can’t feel bad for you if you end up with fish gills and a third arm because you didn’t do your homework before taking a new supplement. 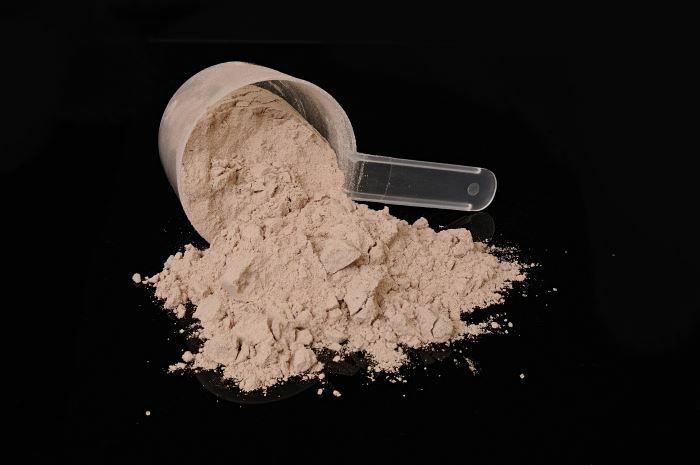 This article includes an explanation of whey protein side effects and related myths. I finish the article describing what dangers you should be aware of if you decide to buy a whey protein supplement. If you’re in a hurry and just want the short answer, I won’t make you wait – whey protein is a safe product, but there are important details you should know. I’ll begin this article by explaining what whey protein is and what it is not. It provides necessary context for explaining the topics of whey protein side effects and myths about protein side effects. Whey is a Food Product. Whey protein is food, plain and simple. It is created in the cheese-making process. The curds (casein protein) and milk fat are separated out and used to make the cheese, leaving just the whey protein to be filtered and dried into a powder. Even though it is in powdered form and typically comes in flashy packaging, there are no more whey protein side effects than there are side effects of milk. Lactose Intolerant. Depending on your degree of lactose intolerance, you may want to consider using whey protein isolate or hydrolized whey protein, which are virtually lactose-free (~1% lactose) vs. whey protein concentrate (~5% lactose). Allergic to Dairy Proteins. Whey protein is derived from dairy products, so you should either avoid it completely or speak to your doctor regarding your specific situation. Don’t worry though, because there are many other effective supplements such as egg, soy, or even meat protein powder. C’mon son! Taking a dump and not being hungry don’t count as real side effects. The same things happen if you eat enough of anything. Obviously, I don’t consider these to be true whey protein side effects, but you can feel free to call them whenever you want. My point is, they’re so minor that if you can’t handle them, you probably can’t handle the gym. Jumping to Conclusions. Unfortunately, there are several annoying myths about protein/whey protein side effects that are going around in the Internet. They have no credible scientific backing. Myths are created by taking a little bit of information and drawing connections. People tend to take them at face value because it’s easier to do than to look it up. Myth #1: Kidney and Liver Problems. This myth exists because some people like to draw very broad or far-reaching conclusions from very specific or limited research. Apples and Oranges. Those who claim these all-too-common myths as fact must be unaware of the fact that all research they’re citing deals with study participants who already have kidney or liver problems. That’s a huge difference compared to the average gym rat with a nice pair of functioning kidneys. Myth #1, Busted. All studies using people with healthy kidneys or livers show no link between high protein diets and kidney issues. Myth #2: Osteoporosis. You can find false claims that high protein diets cause osteoporosis. This myth is founded on outdated research, which basically showed that people on high protein diets had more calcium in their pee. Out-Of-Context Speculation. Specifically, the argument is that high protein intake raises blood acidity and your bones must balance the acidity with calcium and other minerals. This would mean that the bones disintegrate and weaken, which is synonymous with osteoporosis. Myth #2, Busted. However, new research has shown that the higher amount of calcium in urine is due to increased absorption of minerals. So, high protein diets actually help make your bones stronger! protein can cause the side effect of arthritic condition known as gout. Genetics Play the Biggest Role. The vast majority of people who develop gout are genetically predisposed to the condition. In other words, you’ll probably have it if your parents had it, and there’s not much you can do about it. Others can develop the condition, but it’s a lot less likely. Myth #3, Busted. A large, peer-reviewed study did find a link between developing gout and consuming a lot of meat and fish. But, there was no link between developing gout and total protein intake. The study found that intake of dairy products (which includes whey) is actually linked to a decreased chance of developing gout. Why? My guess is that this happens because of all the talk about performance enhancing drugs in the media, combined with the “mysterious” nature of supplements to those unfamiliar with them. Whey Protein Buying Dangers. Although there are no real whey protein side effects that you have to worry about, one thing I do recommend is buying a trusted brand. Or, at the least, don’t buy sketchy looking brands. Supplement Contamination. Although it’s very uncommon, there have been reports of contaminated supplements in the past. Contamination refers to products that are unsanitary or contain steroid, prohormone, or similar substances that obviously aren’t listed on the container. Avoid Dangers with Common Sense. As I said, the risk of an impure product is extremely rare. If you buy from a company with a halfway decent reputation, you’ll be fine. If the package has like 26 typos on the label and a dead rat inside, you might want to reconsider your options. This is the best info that i read on whey protein. Thanks for busting the myths on whey. Best information I’ve read on Google. Before reading this I was constantly considering whey and other supplements the same. Can you suggest a whey protein?